Literally named “opposite Paros”, the island of Antiparos is located 4 nautical miles away from the main port of Paros and only 1 mile from the beach of Pounda. The island has a surface area of 35 square km and a population of 800 inhabitants. The island’s capital is Kastro. The Islands of Paros and Antiparos are separated by a narrow channel. 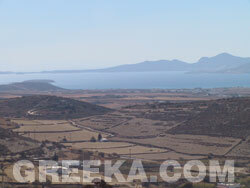 For many years, the island of Antiparos was considered as the quiet and wild alternative to Paros. Today, tourism is increasing, with many new hotels lining the waterfront. However, it still keeps its authentic natural beauty and has some beautiful golden sandy beaches to offer. The capital of Antiparos Island is called Antiparos or Kastro and gathers around the castle built by Leonardo Loredano in 1440 to protect the town from the pirates’ raids. The village is a traditional settlement with white painted houses. One of the island’s main attraction is the impressive caves of Stalactites on the hill of Agios Ioannis, on the south of the island. In 1673, Marquis de Nointel, an ambassador of Louis XIV, organised a Christmas mass with an orchestra inside that cave. Every year, more and more visitors discover the island of Antiparos, which of course leads to an increasing tourism development. Nevertheless, the number of hotels, apartments and rooms are still limited, and hard to find during the high season. The only way to reach the island is with a caique (small fishing boat transformed during summer into a tourist transportation mode) from Parikia, the main port of Paros or from Pounda.